Binded today launched its copyright platform, designed to make "copyright simple." The free service protects your work by creating "a unique fingerprint" permanently saved on the bitcoin blockchain for each image you upload to Binded. You receive a certificate with proof of creation. Binded Certificate. No actual copyright notice, however. "Copyright is an essential part of our world economy, yet no one has built a modern technology company to make copyright useful on the Web," said Nathan Lands, CEO and co-founder of Binded. "Creativity is one of the few things that cannot be replaced by modern technology and in the future it will be even more important that people can make a living using their creativity. Today it's incredibly difficult to identify the copyright owner of a file on the Web. Binded will change that." In addition to photo uploads to the service, images posted on Instagram and Twitter can also be uploaded to the service. The company said it wants to make it possible to link every creative tool to enable seamless copyright claims at the time of creation. Binded is also developing copyright monitoring technology which identifies possible copyright infringements. The feature is currently in public beta. The service itself does not attach a copyright notice to the uploaded images, an exercise left to the creator of the work. And it does not replace registration with the U.S. Copyright Office, as noted in the Binded FAQ. The best time [to Bind an image] is when you first create an image, you put it on Binded. We plan on creating integrations with every creative tool to make this seamless for you. So far we have integrations with Instagram and Twitter with plans for a whole lot more. Binded gives you proof of creation if used when you first create an image. This can help you when sending cease and desist orders or DMCA requests. To win statutory damages in a lawsuit in America, you need an official U.S. copyright registration. In many other countries registration is not necessary in most cases. We plan on providing a service soon to allow you to register your copyrights with the U.S. Copyright Office. SAN FRANCISCO -- Binded, the world's first copyright platform, launched today and announced closing on a $950K round of finance. The new round brings the company's total capital raised to $1.5-MB. Investors in the round include Mistletoe, Asahi Shimbun, Vectr Ventures, M&Y Growth Partners, Tokyo Founders Fund and Social Starts. Binded is a technology platform making copyright simple. Digital photographers and artists use it to protect their work, for free. Creators upload images to their private copyright vault. For every image uploaded, a unique fingerprint is created and saved permanently on the bitcoin blockchain. The creator receives a copyright certificate with proof of creation. "In the era of AI and Robotics, creativity is humanity's most important asset. Binded will become the platform creators use to protect and monetize their creativity. I'm very confident that Nathan and his team will democratize copyright and help create a new economy for creators everywhere," said Taizo Son, CEO of Mistletoe. Binded has created integrations with Instagram and Twitter. Binded wants to make it possible to link every creative tool to enable seamless copyright claims at the time of creation. Binded is also developing copyright monitoring technology which identifies possible copyright infringements. The feature is currently in public beta. Binded will use the new round of funding to hire, build new integrations and add the ability to register copyrights with the U.S. Copyright Office. Headquartered in Japantown, San Francisco, Binded is a technology company building the world's first copyright platform. 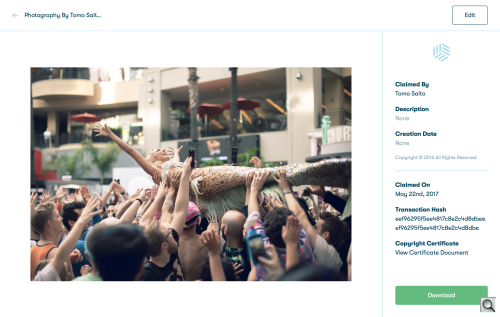 Binded makes it easy for creators to protect their images, for free. Binded's mission is to make creativity the world's most valuable asset. Binded was previously known as Blockai and launched in March 2016. Since launching, Binded has collected over 10B copyright records. Binded has raised a total of $1.5M from Mistletoe, Vectr Ventures, Asahi Shimbun, Sterling Ventures, Social Starts, M&Y Growth Partners, Tokyo Founders Fund and Scott & Cyan Banister.